This limited edition (10000) box set compiles repressings of the Smiths' first ten 7" singles as originally released in the UK: "Hand In Glove", "This Charming Man", "What Difference Does It Make? ", "Heaven Knows I'm Miserable Now", "William, It Was Really Nothing", "How Soon Is Now? ", "Shakespeare's Sister", "That Joke Isn't Funny Anymore", "The Boy With The Thorn In His Side" and "Bigmouth Strikes Again". It also includes two bonus 7"s: "Still Ill" which was originally sent to radio in the UK to promote the band's debut album, and "The Headmaster Ritual" as released in Holland in 1985. Finally the set also includes a 14"x14" poster showing the artwork of all the singles in the box, 4 pins ("the Smiths", "Handsome", Jean Marais from the "This Charming Man" single artwork and Pat Phoenix from the "Shakespeare's Sister" single artwork) and a passcode giving the right to download MP3s of the songs via the Rhino UK website. The release of this box was preceded by the individual re-release of each of the ten singles in the set. "Hand in Glove" and "This Charming Man" were planned to be released on 10 November, "What Difference Does It Make?" and "Heaven Knows I'm Miserable Now" on 17 November, "William, It Was Really Nothing" and "How Soon Is Now?" on 24 November, "Shakespeare's Sister" and "That Joke Isn't Funny Anymore" on 1 December and "The Boy With The Thorn In His Side" and "Bigmouth Strikes Again" on 8 December. It must be said that very few record shops had these singles on sale on the planned week. It is unclear if the record label or the distributors are to blame, but most record shops received the records late, if at all. 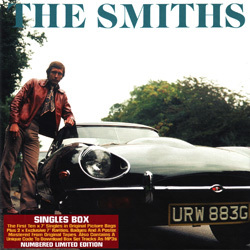 The two bonus 7"s were not sold individually, but on Record Store Day on 18 April 2009 many artists released exclusive vinyl in support of independently owned record shops, and the Smiths contributed the 7" of "The Headmaster Ritual". The version of "The Boy With The Thorn In His Side" that can be downloaded from Rhino UK with a special personalized code found inside the box is the album version, and not the single one found on the vinyl. 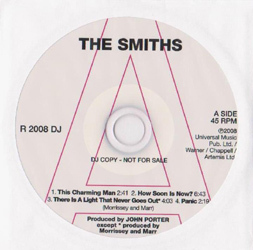 A 4-track promo cd (R2008DJ; view left) featuring "This Charming Man", "How Soon Is Now? ", "There Is A Light That Never Goes Out" and "Panic" was given away with the first 100 orders for this box set. It originally served to promote the recent "The Sound Of The Smiths" compilation. A cd-single edition of this box set was released the following year. See information here. 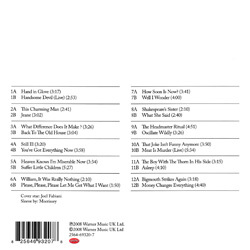 The front cover image was personally chosen by Morrissey. It features Joel Fabiani from the 1969 TV series "Department S". The general artwork of each single in the box is identical to the original pressings, with some minor changes made in the credits to account of the difference in labels. Click on titles above for more information on individual releases. UK: The 4-track promo cd mentioned above was not used to promote this box set as much as the recent "The Sound Of The Smiths" compilation.